We just wanted to say thank you to all of you who follow us and support us! We are giving one lucky winner a change to will all of these prizes worth over $1600! -1 $500 Kroger Gift Card No Purchase necessary. Must be 18 years old to enter. This contest is not affiliated with YouTube. Click on the giveaway to see all terms and conditions. Love all of the items!!! LOVE all of these items! Can't wait to win so i can use them when making all of your great recipes. I'm going to get married next week, I would love to win all these products. I love their recipes, how easy and fun they are ... I'll be crossing my fingers! What a great giveaway! I love cooking and love the website and all your delicious recipes! So generous! You're stuff is always a hit! Your recipe are always great! The kitchen aid mixer for my niece! I would be most excited to win the Kroger gift certificate. 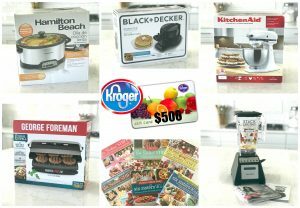 I am a longtime Kroger shopper and I know $500 would go a long way.